FENN STREET GA…OH, ALREADY USED THAT. OK, WHAT ABOUT…PLEASE SIR? 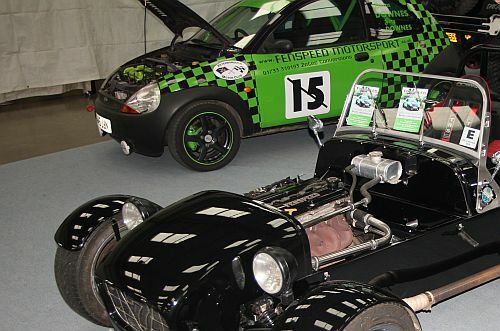 In addition to launching their new Sprint LSIS model at Newark kit car show in June, Peterborough-based Fenspeed now stock inlet manifolds that allow Suzuki GSX-R750 and GSX-R1000 bike throttle bodies to be fitted to Ford Zetec and Duratec units. They are machined from cast aluminium and the company recommends use of a Megasquirt ECU, which they can also supply for £290, although you can go your own way if you wish. The manifolds cost £130 for the Duratec or £169 for the Zetec and you’ll also need to purloin a set of throttle bodies (secondhand will suffice) and a motorcycle brake cable to help adapt your car’s existing throttle cable. What’s more, Fenspeed can re-map the lot for you from around £200. More from 01733 319 193 or www.fenspeed-motorsport.co.uk ENDS. Print article This entry was posted by admin on August 16, 2012 at 2:49 pm, and is filed under News. Follow any responses to this post through RSS 2.0. Both comments and pings are currently closed.